Benchmade Adamas auto. Probably the best knife I've ever had. Spyderco Native at work (in scrubs). 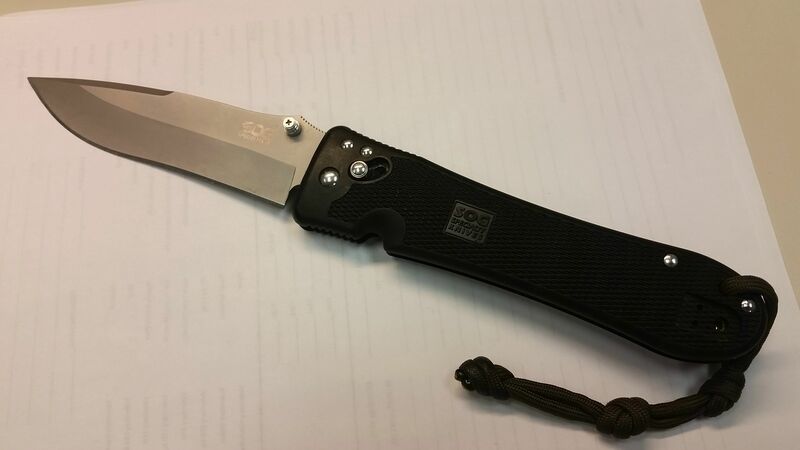 And a Benchmade ATFK for use w other clothing. Carrying a Benchmade 915 Triage now. Edited by mangeface, 17 May 2015 - 08:31 AM. "I may walk among the sheep...but make no mistake, I am the sheepdog." Don't know why I've never posted this. Here goes. Blackhawk CQD Mark I. Maybe $60, I don't remember. Had it close to 10 years I think. I've used every function of it. Used the glass break to retrieve a 6 month old from a locked car while mom and dad were inside a casino. Used (tested) the seat belt cutter in training. And the blade, well, I've used that for everything from cutting my food at lunch, field dressing (poorly) deer, prying door hinges, to arcing the power cable on a diesel starter. If you look close at the blade, you can see parts missing from the arcing. That got interesting. It's a cheap beater/work horse. I never expected much out of it, but it's turned out to be a decent tool. I really like the double locking feature for the blade. Especially since I tend to use it as a pry bar. I got a SOG Vulcan as a gift last year, it has been my EDC since then. Blade locks up solid and it holds an edge well. Al Mar SERE mini operator. My true EDC knife is a Kershaw Leek. Actually, I have two in different colors. Just updated to a HK (Benchmade) 14715 D2 Axis in FDE. Freedom is never more than one generation away from extinction. We didn't pass it to our children in the bloodstream. I see a lot of production knives on this thread, does anyone carry a semi-custom or custom piece? And how do you guys feel about custom makers trying to make it in this market? own knife making company and need some input. Sorry if this is deviating from the thread's initial purpose. I have one knife that isn't a production knife. I wouldn't call it custom, but it's like a micro-brew beer. It's a cool knife with a good blade, but I don't carry it often. Why? A few reasons. 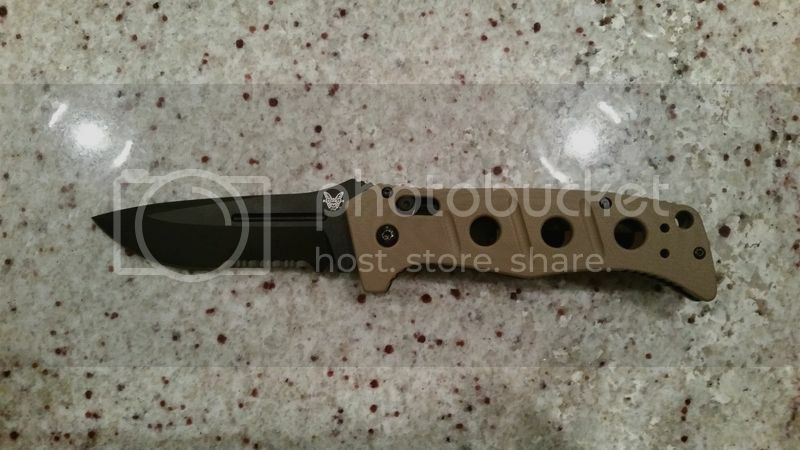 First, it's not a folding knife. It's fixed blade, so I can't put it in my pocket. Second, the kydex sheath it came with sucked, so I had to spend more money getting a custom leather one made. Now I have a cool little knife that's pretty rare and a completely custom sheath. The grand total cost was still quite a bit less than my EDC Benchmade, but I can buy another AFO II if I lose mine. I'd have a heck of a time replacing my micro-brew knife/sheath. What I lack in knowledge & skill, I make up for with sarcasm & bad jokes. Strange, it appears I haven't posted here yet! - Classic Case design, ought to avoid any "weapon" associations (i.e. 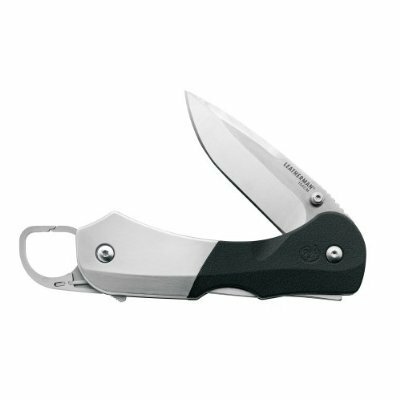 work is an unarmed target zone), still offers convenience of a locking blade, clip and thumb-stud. The thumb stud is a bit stiffer than others I have but so far I couldn't be happier, especially considering I usually like a deeper clip. Others in rotation are the Kershaw Thermite, Benchmade 905, custom Cerakote'd Gerber Evo Jr, and a few others...blades become a bit of an addiction don't they? The day you stop learning is the day you die. I've got a leatherman wingman for my EDC. The blade isn't super long, but it gets the job done, and the extra tools are a plus. 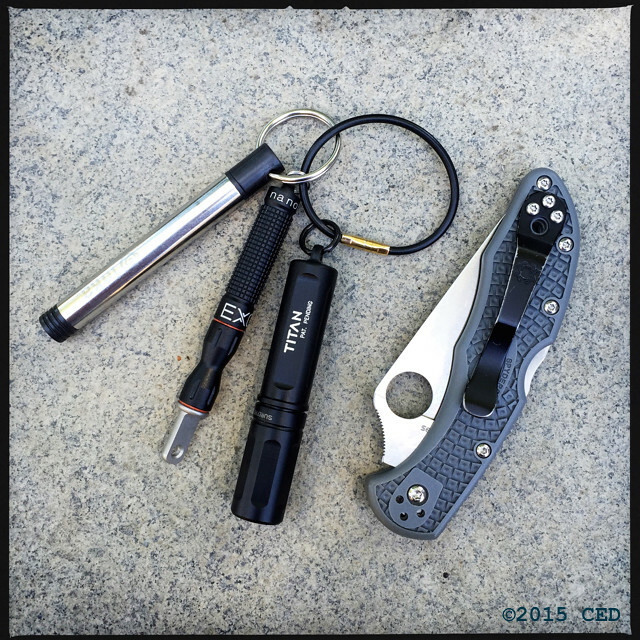 I usually have a longer more tactical oriented knife in my backpack, but I don't always have that on me. 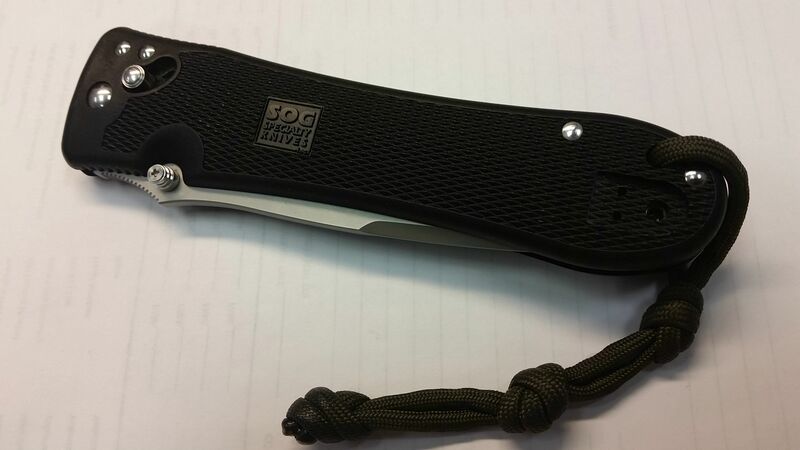 The EDC knife I carry is a SOG Spec Elite 2. I have never had a VG-10 blade before, and thought I would give it a try. After having it for a year. I am quite happy with it. The knife itself is a little long with a 5 inch blade, But it is well balanced and I love having that extra reach in a self defense blade. It fits well in any pocket, whether it would in dress or jean pants, and it is not as obvious as I first thought it would be. You would also think that the knife would be heavy being as big as it is, but it is very light. Which once again makes it comfortable to carry in my pocket. I usually always carried a much smaller knife, because in our Arnis training we were always instructed that a smaller knife is more nimble in your hand, and harder for a combatant to wrestle out of your grip. Which probably holds true, but for me I work mostly with long knives during training (ex. machetes, or small Kriss swords); So the length gives me familiarity and confidence. My only complaint is the handle material. which is some kind of reinforced fiberglass. It feels cheap, but if it wasn't for the fiberglass the knife would be heavier. I would love to have a Micarta or G10 material on it. I've been trying to find a way to fix the grip problem, but I have not found any solutions yet. Other then that its been an awesome knife. Reliable, Smooth draw, Good Clip (which I love how high it is on the handle, because it hide the knife more in my pocket). 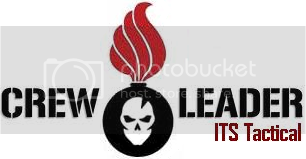 Edited by Leaf, 25 September 2015 - 02:22 PM. This is a Torch II Tanto. I have carried it every day for about three years. Before that I had a Gerber Fairbairn Applegate that I carried for years in the US and Europe.I wanted something a bit smaller and the Torch II has met all of my expectations. I prefer tanto blades and a positive grip. I have never had to use it violently but it is quick to access and open.It is also great for prying, hammering, cutting rope and opening boxes. When I got it, it was so pretty I was afraid it would quickly become worn but it is still scary sharp and the exposed bits are merely a bit faded.